When you or your child has a fever, time is of the essence. You want to immediately know the current body temperature with as much accuracy as possible. Old-fashioned mercury thermometers took too much time, and these thermometers held dangerous elements that could harm someone if they accidentally broke. From digital technology to current infrared trends, you now have another choice for your body-temperature needs. The forehead or temporal thermometer advertises the ease of swiping the device against your skin for an accurate temperature. Doctors’ offices have used ear thermometers in the past that employ the same technology, and now you can fight a fever even better with the latest temporal thermometers on the market. The hands-down winner for the best forehead thermometer is Generation Guard’s clinical model. With an unassuming design, this thermometer holds many features that many other models don’t have collectively. This temporal thermometer uses a scanning mechanism in order to “read” the skin’s temperature. It’s important to note that some consumers are wary of this technology compared to old-fashioned oral thermometers, but consistent accuracy within this product alone is enough to make you look twice. Discover the myriad of benefits associated with the Generation Guard thermometer. When you pull the thermometer out of the packaging, you’ll be instantly pleased with the simple grip. 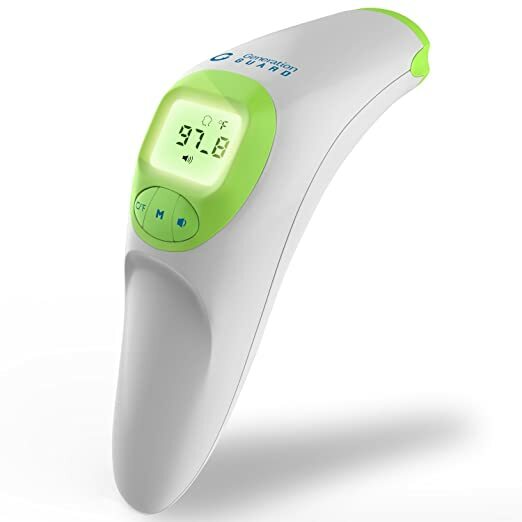 The thermometer has an ergonomic design that makes it easy for anyone to hold the handle. At the curved peak, you’ll see the temperature display. The scanning mechanism resides right behind the display so that you can take a reading just like a professional. Grandparents, parents and other caregivers won’t fumble with the perfectly sized grip when a child is fussing because of a fever. Successfully handling a tool during a stressful situation allows any caregiver to move forward with the right treatment. As you press the scanning device for a reading, the process takes about one second. You simply move the thermometer between the temples in order to read the forehead. This response time is incredibly fast even for a forehead thermometer. Other devices take several seconds or minutes to read the temperature. Some consumers are concerned about the lack of accuracy within a one-second reading, but many tests have show that only a small deviation is present with each scan. If a baby is sensitive or an adult is irritable, touching either party with a standard thermometer might be aggravating. Generation Guard’s ingenious design doesn’t require any contact, however. Hold the device about an inch or half-inch away from the skin and scan the person. This feature makes the thermometer perfect for a sleeping baby. Every parent can be completely sure about their child’s health without waking them. Because sleep is so important to every ailing patient, this thermometer is a valuable tool for care during any time of the day or night. The manufacturer knows that you’ll use this thermometer in many different situations. With this fact in mind, the designers added a volume control. You may instinctively wait for a beep to verify a temperature, but a sound in every situation isn’t necessarily helpful. A sleeping person will wake to the beep so turning it off is a crucial feature. You’ll still be able to see the temperature reading in either the dark or light because of the backlit display. The soft glow allows you to perform your work as an amateur nurse while avoiding any disturbances to the patient. The small details make this thermometer a stellar investment too. You can immediately use the device because it comes with batteries and a storage bag. The batteries are fresh upon arrival so that you can make sure that the device is properly working. Place the thermometer in the bright-green bag when its not in use, which protects it from any damage. The colorful bag makes the device easy to spot when a health emergency occurs. An important part of taking a temperature is watching its changes over time. The person may be worsening or getting better based on those crucial numbers. Generation Guard’s device offers a memory with up to 20 readings. Scroll through all of the past readings in order to understand the temperatures’ trends. In many cases, these readings will determine if you need to visit a doctor or simply remain resting. Simply read the thermometer’s instructions regarding the memory access. There are only three buttons to manipulate on the device so the process should be relatively simple. A unique feature of this thermometer is its use around the home. Because it scans an object for a temperature, you can use it on baby bottles or entire rooms. Toggle the device between a forehead or object scan, and you have an instant reading of almost anything in the home. When it comes to warming the baby’s bottle, parents are always concerned about burns and uneven temperatures within the milk or formula. This temporal thermometer gives you a chance to verify the safety of the bottle before it reaches the baby’s mouth. Extra features on this high-end thermometer makes it a smart investment for years to come. Use your common sense when you pull out any thermometer. The person should be calm, relaxed and free from excess perspiration. Scanning the skin will be more accurate when you have cool, supple surfaces involved. Excess sweat can throw off the scanner, and the moisture’s presence normally means that you’ve been moving around too much. Sit down for at least 30 minutes before taking a temperature with any thermometer. Your true body temperature will appear with ease by using these strategies. 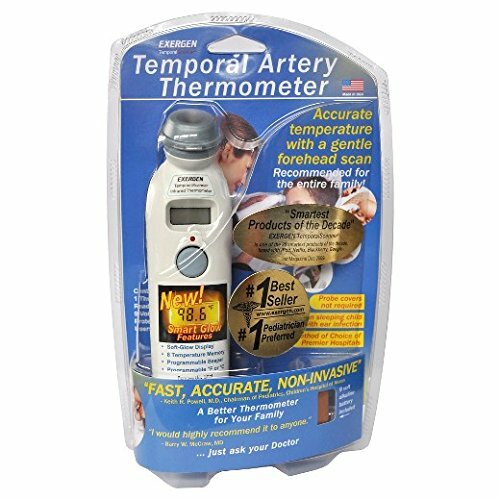 When you want a less expensive thermometer for your family, the temporal artery device by Exergen is a perfect choice. The price is better than the Generation Guard, but you still have several features to enjoy. This thermometer comes in its retail packaging so you’ll have to find a safe area to store it without a bag or container. A medicine cabinet is often the best location so that you can access it with ease. This device differs from other models on the market, and it’s worth the time to familiarize yourself with its features. The biggest difference between this thermometer and the Generation-Guard model is the need for touching. You must gently slide this thermometer on the skin in order to produce an accurate reading. The touch doesn’t have to be forceful. In fact, it can barely touch the skin as long as it’s consistent throughout the entire reading. Some consumers appreciate the touch feature because it tells them that the reading is being taken. Floating the device across the skin is often deceiving, and the person may not know when the reading is correct or incorrect. You aren’t limited to just scanning the person’s forehead when you use this thermometer model. It’s possible to scan the carotid artery that resides on the neck. If a person isn’t in a good position to scan the forehead, the neck is an option that’s often just as accurate as the forehead. This artery is extremely close to the heart, which allows the temperature reading to be as accurate as possible. If you’re unsure of where the carotid artery is located, you can always ask your doctor about the region during a followup appointment. Knowing more about your body will help you take care of it better in the future. Consumers appreciate the beeping indicator when the device scans a proper reading. You’ll always know if the device worked as it was designed to perform. Other thermometer models create more questions than answers for an ailing patient. Listen for the beeping as you take multiple readings. Several temperatures taken within a short time period should be relatively close in value. The thermometer’s design doesn’t have a curved shape to it, but it’s thick enough for a comfortable grip at the end. Use caution when you grab the device because it’s possible to activate the button near the center of the grip. You might record a reading that deviates from your recorded history within the device. The Exergen thermometer has a memory of up to eight readings. Some consumers report their difficulties scrolling between the different temperature values. It’s necessary to read the instructions in order to scroll through the device’s modes, and change the values between Celsius and Fahrenheit. For most users, however, you’ll choose one value and remain with it for the life of the thermometer. Be aware that this thermometer comes with a cover on its tip. Some consumers have reported poor results with the device, but they needed to remove this cover for better accuracy. It’s also necessary to clean the tip as you swipe loved ones during their ailments. A little bit of rubbing alcohol on the tip will clean it so that sterile conditions return to the thermometer. Some consumers have reported some issues when they’ve worked with the Exergen model. However, many of these complaints are merely application errors. The device must touch the person for the duration of the forehead scan. If you remove the device too quickly from the skin, it will cause an error. Follow the directions as carefully as possible, and you won’t have any issues with the thermometer. There have been mixed reviews regarding the dual-mode thermometer from Innovo. Accuracy concerns have plagued this brand, but its updated sensor in 2016 means that the engineers have been hard at work to improve any issues. With this fact in mind, you’ll want to try this combined forehead and ear thermometer. You’ll have the peace of mind knowing that both regions will have an accurate value in order to plan your day. Heading to the doctor or resting at home is often the difference of just one degree on the thermometer. At first, you’ll be delighted to see the device’s sleek design. It has a metallic exterior with two buttons flanking a bright, LCD screen. The buttons correspond to the two different modes included in the thermometer. Use the upper or F1 button for the forehead measurement while accessing the F2 button during an ear-temperature reading. Choosing between the different measurement types depends on the ailment and person involved. Sleeping babies might remain so if you use the forehead measurement. When you’re concerned about an infection or other serious ailment, an ear measurement is an accurate alternative. Users have reported that the unit has a pleasant indicator that employs both lights and sounds. It’s difficult to miss a growing temperature when the device sounds a distinct beep and flickers with its glowing lights. This indicator, however, may have a downside. The alarm bells might disturb ailing patients as they rest, and it’s unclear if there’s a volume control. The manual states that the sound is within a comfortable decibel level, but this concept is subjective for each person. For most consumers, they’re generally pleased with the indicators even when the volume control is questionable. A fantastic feature included in the Innovo is IR shielding. Infrared light actually surrounds everyone each day. Some of this light can interfere with the thermometer’s functions and accuracy, however. The manufacturer solved this issue by shielding the product from any ambient IR light. You won’t notice this feature as a user, but it’s reflected in the unit’s accuracy. The shield basically forces any light to bounce away from the area. You’re only left with the infrared light produced by the thermometer as you take a measurement. Most forehead thermometers require you to swipe the skin in a certain direction with some gentle pressure during any accurate readings. Most consumers are pleased to discover that this thermometer only requires a slight touch to the skin. There’s no need to slide the device across the forehead. Simply touching one area on the forehead allows the scanning device to concentrate its readings in that area. There are fewer chances for an inaccurate reading as a result. Babies and seniors will appreciate the quick touch and less-than-a-second response from the Innovo thermometer. This thermometer comes with batteries so that you can use it the moment it arrives at the home. If you’re planning on storing the thermometer away, such as during the summertime, remove those included batteries. Leaks can occur during storage, and you want to preserve the thermometer’s internal parts. Place the batteries back in the device when you’re ready for fall and winter ailments. Your Innovo thermometer will last for hundreds of readings with fresh batteries and proper care. Braun is a well-known name in the personal-hygiene world, and that fact includes their budget-friendly forehead thermometer. 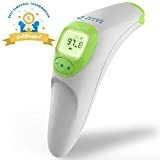 With a price tag that’s well under $20, you’ll be able to take advantage of the thermometer’s infrared technology while keeping all of your loved ones healthy and happy. In many cases, this device outshines more expensive models on the market. 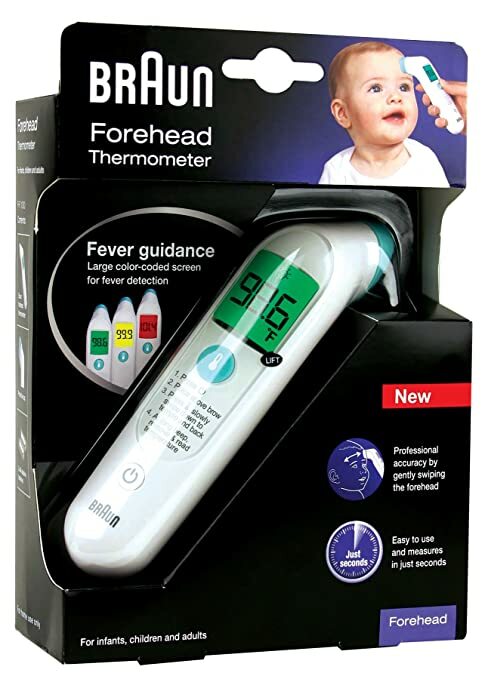 If you’re simply curious about taking temperatures from the forehead, the Braun thermometer is a great starter kit for your family. When you hold the device in your hand, you’ll notice two buttons facing you. The lower button is meant for power while the upper button is for readings. As an added benefit, you also have the device’s instructions written out along the handle. If you’ve forgotten how to accurately use the thermometer, the instructions make the process simple. Loved ones who’ve never touched a temporal thermometer can also use it with ease after reading the easy instructions. The manufacturer doesn’t provide an exact time frame for the readings. Advertisers mention several seconds are needed for an accurate temperature. Most consumers report that one swipe is usually enough time for the device to report a value. The instructions note that two complete swipes from temple to temple are usually necessary during a reading. As a result, the consumers’ experiences with the swiping time are better than expected. 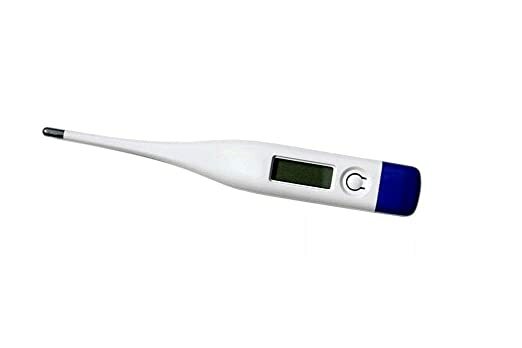 This thermometer doesn’t come with any covers for the tip, which is perceived as both a benefit and drawback. Thermometers that require a cover cost more over time because consumers need to buy the extra accessories. In contrast, devices without covers may have sterility problems as they’re exposed to household germs. The manufacturer simply suggests that the tip should be cleaned with an alcohol prep pad after each use. This simple cleaning task keeps the household healthy while prolonging the life of the thermometer. Each swiping action can pick up particles and sweat that can slowly break down the tip over time. Consumers are pleased with the thermometer’s tip because it differs from others on the market. Most temporal thermometers have a plastic tip that’s meant to protect the interior scanning mechanism. However, the plastic doesn’t feel comfortable when it’s placed on the skin. Braun’s thermometer offers a soft tip for the most sensitive people. Babies and seniors will notice the difference as the soft materials caress their skin during each swipe. In fact, they may barely realize their temperature is being taken with such a soft accessory on the device. The last, main benefit to Braun’s thermometer is its indicator. The display is large and easy to read, but it’s also color-coded. A green indicator means that the temperature is normal. Yellow indicators issue a warning because the person has a borderline fever. A red indicator is an outright fever, and the person should be concerned about their health and rest at this point. Be careful when you place the thermometer down. It doesn’t come with a container or bag, and the two buttons on the handle can be easily pressed by accident. Ideally, lay it on its side in order to store it safely. Pressing the power button and leaving it on will only drain the battery. You want the thermometer to be ready at a moment’s notice when someone is sick. Regardless of your chosen thermometer brand, it should have its specifications spelled out in the instructions or on the retail packaging. You’ll see an accuracy value that should be relatively small, such as less than half of a degree. Many manufacturers explain their device’s accuracy with greater detail on their website. These thermometers should be factory calibrated and verified by highly trained professionals before they’re sent out to the public. You may even see the calibration specifications spelled out for certain thermometer models and serial numbers. At this time, you cannot calibrate these thermometers at home. The factory performs this service so that each device is extremely accurate. You might see calibration kits sold online, but these tools are mainly used in healthcare facilities in a professional capacity. If you’re concerned about the accuracy of your thermometer, you can always test it alongside another model. The values should be relatively close after testing them several times. Contact the thermometer’s manufacturer if the values are one or more degrees off on a consistent basis. Scanning thermometers do have some fluctuations when specific external influences affect them. If you’ve recently eaten or performed a physical activity, sit and rest for about 30 minutes. Allow your body to reach its normal temperature when it’s not digesting or recovering from movement. These actions will elevate your temperature and possibly indicate a false fever. Temporal thermometers don’t work well if there’s dirt or grime on the skin either. The scanning mechanism might bounce off of these particles and indicate an incorrect temperature. Ideally, you should wipe the forehead clean before any temperatures are taken. Every top temporal thermometer will perform poorly when any surfaces are marred with too much grime or moisture. It’s also critical to reduce negative influences on the thermometer from poor handling. Don’t shake the device or hold it too far from the skin. Use a firm motion as you run the device across the forehead. A steady hand contributes to the device’s successful readings. You might be concerned about paying for a high-end temporal thermometer so you seek out the least expensive model. This strategy isn’t necessarily a poor one, but you should still seek out certain device features for your family’s health and safety. Don’t overlook the importance of memory storage. You may need to pay a little bit more for this feature, but it helps you during those frustrating cold-and-flu seasons. A cold may slowly turn into an ear infection, which is indicated by a spiking fever. If you don’t see the trending temperatures saved in your thermometer, you may miss the need for antibiotics. Look for a thermometer that holds at least 10 memory readings. If you want even more documented measurements, it may be necessary to write them down. All of this information helps your doctor when a visit is necessary. When the health professional can see the changing fever over time, a more accurate diagnosis is possible. If your forehead thermometer has low batteries, it may scan the skin with incredibly inaccurate results. You may not realize the extent of the battery’s influence until you’re on the way to the doctor. Many of these thermometers come with batteries already installed. Test the new device with a trusted thermometer before you use it on a loved one. Those batteries should be fresh at this point. As time passes, the batteries will slowly wear down. Check them with a battery tester found at any home-improvement store. If you’re unsure about the batteries, simply swap them for brand-new ones. Alternatively, use rechargeable batteries in your thermometer. You can charge them repeatedly in order to always have enough power during a scan. Thermometers don’t require a lot of energy for each scan, but they need enough for accuracy each time. Regardless of your final purchase, forehead thermometers need to be carefully handled each time that they’re used. Their operation and accuracy can be just as precise as the most expensive thermometers in the industry, but you simply need to know how to use the product as it’s been designed. Read the instructions and keep them handy. You won’t use the thermometer every day. When a sickness strikes the family, you’ll be able to activate and use the thermometer with ease. Knowing an accurate temperature helps both you and the doctor when it comes to curing an ailment. Treating a flu is very different than fighting an infection.